Atal Bihari Vajpayee, the 10th prime minister of India who died his on Thursday evening, will be cremated today with full state honour. Atal Bihari Vajpayee's last rites will be held at Smriti Sthal. 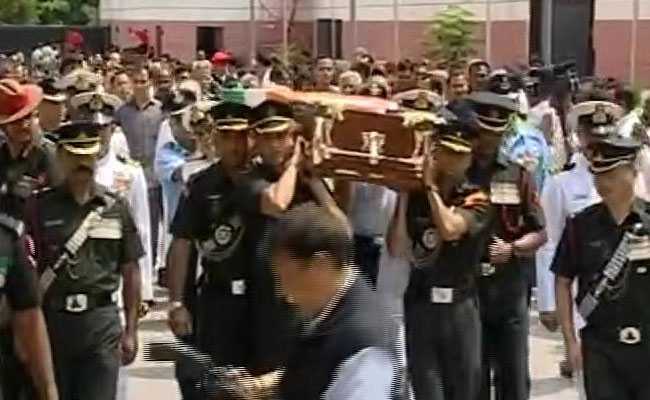 The Delhi Police has made elaborate security arrangements for the last rites procession of former Prime Minister Atal Bihari Vajpayee, who died on Thursday at All India Medical Sciences. The procession will pass through Pandit Deen Dayal Upadhyay Marg, Bahadur Shah Zafar Marg, Delhi Gate, Netaji Subhash Marg and Shanti Van to reach Smriti Sthal where the BJP leader will be cremated at 4 pm. "We have made elaborate security arrangements in the city today. It will be ensured that people who come to pay their last respect face minimum inconvenience. Also, there will be no compromise with security," Deputy Commissioner of Police (New Delhi) Madhur Verma said. The Delhi Police on Thursday issued traffic advisory by keeping in mind the final procession of former prime minister Atal Bihari Vajpayee. Almost all roads leading to central Delhi including Krishna Memon Marg, Akbar Road, Janpath and India Gate C-Hexagon, among others, will remain closed from 8 am onwards for the general public today in order to ensure smooth vehicular movement during Vajpayee's final journey. Traffic will also not be permitted on lower Ring Road from ISBT Kashmere Gate towards Shantivan and from IP flyover towards Rajghat. Commuters from south Delhi can take Aurobindo Marg, Safdarjung Road, Mandir Marg, Panchkuian Road and Rani Jhansi Marg to reach north Delhi and vice versa. The north part of the city can also be accessed via Connaught Place, Minto Road, Ajmeri Gate, Lahori Gate Chowk and SP Mukherjee Marg. The same roads can be taken to reach south Delhi. Commuters can also take Nizamuddin bridge to cross Yamuna, GT Road and cross over to ISBT and reach north Delhi. In east Delhi, Vikas Marg, Shahdara and Wazirabad bridges will allow traffic to hit Ring Road. Vajpayee, the 10th prime minister of India who died on Thursday evening, will be cremated today with full state honour. The 93-year-old BJP, who led the National Democratic Alliance government from 1998 to 2004, was the first-ever member of the BJP to become India's Prime Minister.